What was to become one of the bitterest disputes in modern day Australian industrial relations history was triggered when the Patrick Corporation, with the backing of the Howard federal government, unilaterally sacked its unionised dock workforce and prevented workers returning to work by bringing in security guards and the police to lock them out. New non-union staff were brought in, some of them former soldiers secretly trained for the role in Dubai. The union movement fought back. Huge pickets were formed barring access to the ports, involving not only MUA members but supporters from many other unions, while the MUA took the matter to court. The employer’s actions were ruled unlawful, and Patrick was forced back to the negotiating table, resulting in a new agreement that saw the workforce reinstated and their right to union representation restored. The locking out of workers was a new tactic in 1998, but sadly it is rife today, with big business adopting it as its preferred modus operandi. In the past year, we’ve seen workers from Glencore’s Oaky North coal mine locked out for 230 days and Esso Mobile prohibit workers from returning to the job, and they remain locked out more than nine months later. Yet at the other end of the scale, we have seen Sydney train drivers threatened with legal action if they withdraw their labour for a single day. The scales must be balanced so that a worker will always have the right to strike. It is one of the reasons we must Change the Rules. As in 1998, when members of the QTU joined the picket line in solidarity with members of the MUA, we will do it again in 2018 in our pursuit to Change the Rules. We will be lending our support and prosecuting the case that our current IR laws are unjust and unfair. We know we can win, as the MUA workers did 20 years ago. 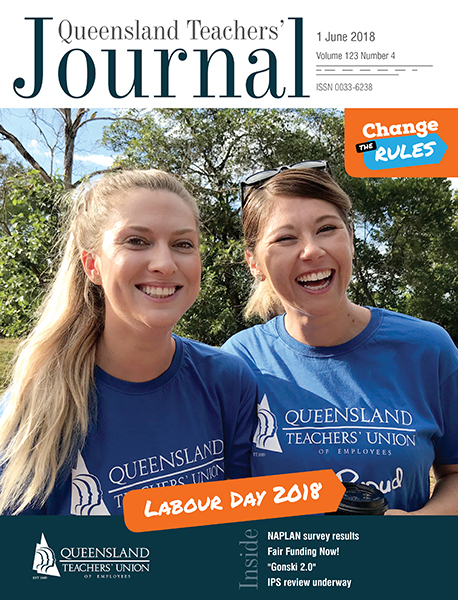 As an affiliated union of the Australian Council of Trade Unions (ACTU) and one of the largest unions in Queensland, our involvement and support is fundamental for this very important campaign to be successful. Additionally, the students we teach, and their parents, are likely to be employed under federal government industrial relations rules. These rules are currently broken, they are designed to work against workers’ best interests, which is why the QTU is involved. If you teach in a high school, then you’re likely to have a student in your class who's already felt the effects of the Fair Work Commission’s decision to reduce penalty rates. Over the past decade, working class families have had their working conditions slowly but surely dismantled, to the point where we now have a working class poor in this country. The experiment with trickle-down economics has failed to provide secure jobs or fair pay rises for most workers. Even though big business profits continue to soar, we see a race to the bottom on wages and job security. Inequality is at a 70-year high and we’ve seen the gap between the very rich and everyone else widen. Although QTU members are employed by the state government, our TAFE members have felt the direct impact of federal government budget cuts in the system. TAFE funding has been cut by 15 per cent, apprenticeship numbers have crashed by 34 per cent, and publicly-funded places at universities have been frozen. The experiment of privatising vocational education and training has been a disaster, to the point where students are priced out of education. Young people are unable to get the skills they need for more secure jobs. The QTU is determined to give the students we teach and their families a liveable wage and the best working conditions possible. To do so, we must Change the Rules.